Dan Dean's original Solo Strings library comprised violin, viola, and cello, beautifully recorded in 24‑bit stereo and converted to 16‑bit. 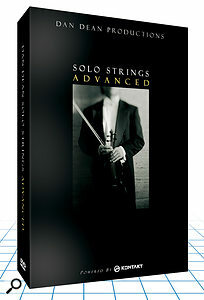 Now, in true Hollywood style, there's a sequel, with lots more special effects: the 2.5GB Solo Strings Advanced (SSA) makes good use of the Kontakt engine, with some very clever programming and convolution‑based features. Presets are presented in three groups. 'All‑In‑One' offers the same six articulations as previous libraries (Arco vibrato, Spiccato, Pizzicato, Tremolo, Half and Whole Step trills), all available via keyswitching, but the Spiccato and Pizzicato now feature auto‑alternation of two 'takes' for greater realism, and the new sustain‑pedal-driven legato mode provides shorter attacks for smoother real‑time performance of fast passages (one of my few grumbles with the original). With 'Voice Control — Divisi', each preset provides a single articulation, but the keyswitching (or the mod wheel) controls the number of players. Unlike the huge gulf between the solo and ensemble choices offered by most string libraries, SSA lets you change on a note‑by‑note basis between solo player, three‑instrument, and six‑instrument ensemble in the case of cellos or violas. For violins, you get an even more ambitious selection, courtesy of a new set of 2nd violin samples, with solo, two first plus one second, three first, three of each, six first, or six of each. This range offers unprecedented real‑time control, and for even greater realism you can activate the 'Cloaking Device', which performs subtle trickery with alternate samples and other note characteristics, so that each note sounds slightly different. In the case of the first two preset groups, you can also control real‑time dynamics via the mod wheel, or breath, or expression controllers, and release time from MIDI Continuous Controller 20. The 'Legacy' presets are simpler, offering one articulation each, with no keyswitching. They revert to the normal sustain‑pedal function, but still offer attack and release tweaks: ideal if you plan to ignore the manual! All presets now benefit from 26 specially selected convolution reverb impulses, ranging from a very small room to a large symphony hall, so your acoustic options are extremely flexible. The Timbral Impulses are intriguing: they let you remove the resonant character of the original recorded strings and replace it with one of 24 different 'sonic fingerprints', captured from recordings ranging from live classical performances to famous pop songs. These offer great tonal flexibility, ranging from smooth and dark to thin and wiry. Names are cryptic, but I'd bet '03 ER' is Eleanor Rigby!